Prominent enterprises with global presence such as Sumitomo Corporation, GKN plc., Hoganas A.B., and AMES are domiciled in Europe. This has rendered the Europe sintering market highly competitive. These players together held 20% of the market in 2015, which is indicative of its fragmented vendor landscape. A majority of the leading players in the Europe sintering market have established brand identities. This is a key factor determining their success amidst end users, finds Transparency Market Research (TMR) in a new study. 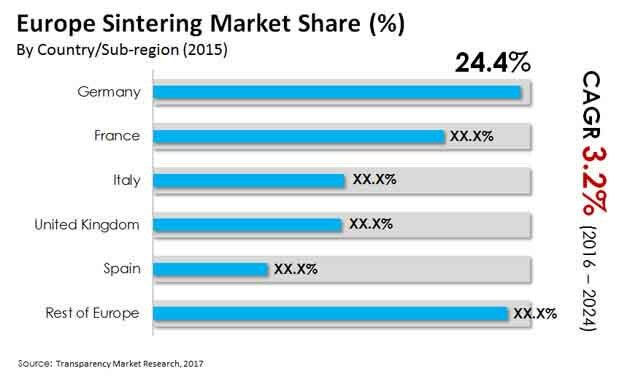 Nevertheless, with industrial and technological developments in sintering process, industry experts have positive outlook for the Europe sintering market.